Hank Stern has posted the latest edition of Health Wonk Review. Essential for wonks, a nice option for the rest of us. Check it out here. The Group Insurance Commission (GIC) in Massachusetts came up with a nifty idea: let’s grade physicians based upon efficiency and competence; we’ll reward those with high marks and penalize those who are (relative) failures. (The GIC administers health plans for public sector employees.) The GIC worked with the MA Medical Society (MMS) and a number of insurance carriers to come up with a reasonable methodology and metrics for grading doctors. After four years of planning, the GIC rolled out the program. Unfortunately, the MMS rolled out the lawyers: they are suing GIC and a number of health plans for defamation, interference, breach of contract, bad faith and violation of due process. Other than that, Mrs. Lincoln, what did you think of the play? The MMS claims, first, that the tiering system is based upon faulty data. For example, one doctor who specializes in treating severe cases of multiple sclerosis has an inflated “cost per patient” due to her inter-disciplinary approach. She has a tier 3 ranking. But this low score does not take into account the severity of her patients’s conditions or her success in treating them. In another example, one doctor simply examined medical records and provided an interpretation: he was held accountable for the ultimate treatment provided to patients he never actually saw. With low rankings based upon incomplete and often inaccurate data, the MMS concluded that good doctors have been defamed. In addition, MMS claims that patients have been defrauded, by being directed toward certain doctors for no particular reason. They pay less for tier 1 visits, even though they may not be getting the best available services; conversely, they have to pay substantially more for tier 3 visits, even though the quality may well exceed that of tier 1 doctors. Dr. Bruce S. Auerbach, president of the MMS, said efforts to improve the tiering program have failed. We all know that there are physicians whose services are mediocre and at times, dangerous. But the problem is in the data: how do you determine the quality of services? How do you distinguish between prudent and outrageous treatment? Data is data, but behind the numbers are stories of lives saved and lives ruined. Number crunching computers cannot tell the difference. Unless the parties settle prior to trial, the discovery process will expose GIC’s methodology for grading doctors as clearly as an MRI. Based upon the MMA’s lawsuit, the GIC’s metrics appear to be fairly crude. The good news is that a number of mediocre doctors have been exposed. Unfortunately, the broad net cast by the tiering system has tainted the reputations of some very competent and compassionate physicians. In this particular endeavor, “reasonably close” assessments are not sufficient. The margin of error – where the reputation of a doctor is at stake – is very small indeed. Medicine is both a science and an art. With the livelihoods of medical practitioners at risk, any methodologies for evaluating the quality and effectiveness of services must be precise and accurate to the nth degree. If your methodology cannot distinguish between incompetence and art, if it cannot place virtually every outstanding physician in the top tier, then the metrics are pretty worthless. At first glance, GIC’s admirable effort to triage the docs fails to pass muster. In all likelihood, the pending clash in court will send all the parties back to the proverbial drawing board. vlingo is a Cambridge MA firm specializing in voice recognition software. They have completed a study of driving habits, specifically, the prevalence of driving while texting (DWT) across the US. The results, in the context of the upcoming Memorial Day weekend, are nothing less than terrifying. In a survey of nearly 5,000 consumers, fully 28 percent of drivers (mostly under 30) admitted to texting while driving. Twenty eight percent! The problem seems greatest in the south, with South Carolina ranking a dubious number one. (“Hw yal dun?”) The New England states appear to be a bit slower to adopt this radically unsafe practice. Massachusetts ranked 23rd in the study, with Maine, Vermont, and New Hampshire ranking near the bottom. The Insider has already blogged the first two recorded deaths attributed to DWT: Lucas Rolin in the United States and Marni Triggs in Tackley, England. Apparently, “Lucas” and “Marni” are just the first of many names to be carved onto a cell phone shaped monument. In Massachusetts, we have long assumed that the “nut behind the (other) wheel” is full of aggressive tendencies. Apparently, we don’t know the half of it. As we barrel down the highway at 72 miles per hour, we might be next to some whackjob channel surfing his radio, fiddling with the GPS and exchanging text messages with a distant buddy. Yikes! Fully 85% of survey respondents said they would not DWT if it were illegal. While it might seem like legislative overkill, that might just be the way to go. What do Bank of America, Citigroup, Merrill Lynch, J.P. Morgan Chase and Morgan Stanley have in common? If you said they all have lost billions in absurdly risky loans, you would be right, but that’s not the answer we are looking for. We learn in the latest edition of Cavalcade of Risk, ably hosted by Jason Shafrin of Healthcare Economist, that these companies have all filled new positions entitled Chief Risk Officer (CRO). In fact, you will find that many of the companies involved in the great mortgage fiasco of 2008 are trying to mitigate future risks by hiring into these positions. It would be interesting to read the job descriptions. Being a Risk Manager is one thing; Chief Risk Officer sounds a bit more, well, exposed. Good management teams empower everyone to focus on risk. Will CROs be able to do this? Or is the CRO just another way for senior managers to toss someone else under the bus? Only time will tell. Rhode Island may be small, but when it comes to tackling the problem of undocumented workers, they think big. Last month, Governor Donald Carcieri issued an executive order encouraging law enforcement officials – from state police to local cops – to determine the immigration status of anyone taken into custody and take immediate steps to deport those who are here illegally. Rhode Island has basically concluded that the federal government is not going to enforce the law, so they will take on the burden themselves. For the record, the scale of the undocumented worker problem in Rhode Island is relatively small: the governor estimates that there are between 20,000 and 40,000 such workers in the state. What is not clear from the executive order is just how proactive the governor wants law enforcement to be: it’s one thing to check people’s status after they become involved in the criminal justice system; it’s quite another to go out looking for immigration violators. Do you check for citizenship after a motor vehicle citation? After a domestic disturbance? When you hear people speaking Spanish? Earlier this year we blogged the story of Edgar Valasquez, an undocumented worker who was seriously injured in an accident involving a chain saw. His employer dropped a dime on Edgar, who was arrested and deported while on his way to a workers comp hearing. Eventually, Valasquez was able to collect his benefits (he currently is back home in Mexico). Despite the assurances of Judge Healy, there is no way for the workers comp system to ensure the rights of injured illegal workers. The latter can pursue statutory benefits, but they do so in the shadow of the governor’s new enforcement effort. Judge Healy cannot prevent law enforcement from arresting comp claimants outside his courtroom. Donald Carcieri invokes the authority vested in him as governor of the “State of Rhode Island and Providence Plantations.” It appears that he takes the “plantation” part of his title seriously. He is creating a segment of the workforce with few more rights than slaves. We all agree that there is a problem here that desparately needs fixing. Despite the continuing inability of the Congress to fashion a coherent legislative approach, this is no time for individual states to jerry-rig their own solutions. A little patience is required. In this key policy area, the “Ocean State” will soon be lost at sea. Time for a blogroll and sidebar update! We’re always looking for new resources to keep things fresh – we’ve been told we have the best compilation of workers’ comp link resources on the web – we hope it’s useful to you. The Safety Blog – this blog is sponsored by Safety Services Company. Since December, they’ve been offering news and tips for safety professionals. 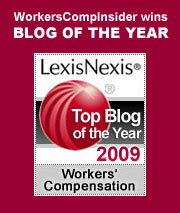 There’s really substantive information posted – a good addition to the health & safety blogosphere. Health Blog – WSJ – reporter Jacob Goldstein spearheads this Wall Street Journal blog that focuses on health and the business of health. Scott Hensley an erstwhile WSJ reporter on the drug industry is also a frequent contributor. GoozNews – We’ve linked to Merrill Goozner’s site through Health Wonk Review before, but hadn’t added him to the sidebar. “Gooz” is an author and former journalist for some of the nation’s premier news publications – in the area of health policy, he always has something interesting to say. GotSafety Blog – This appears to be more of a safety news aggregator than a blog, culling excerpts and links from various places around the Web. Does this Workers Compensation settlement require a Medicare approval or set-aside? (PDF) – this handy flow chart offers guidelines on when and where Medicare Set-Aside are required. An Unhealthy America – “the economic burden of chronic disease” – Over 162 million cases of seven common chronic diseases — cancers, diabetes, heart disease, hypertension, stroke, mental disorders, and pulmonary conditions — were reported in the U.S. in 2003. A clickable map shows how states compare based on the prevalence of these diseases. Meatpacking in Iowa: Not Exactly Kosher? Postville Iowa is a one traffic light town with a population of 2,300 people. Last Monday, as we read in the Washington Post, 17 percent of the town’s residents were arrested in a raid coordinated by the Immigration and Customs Enforcement (ICE). All were employees of AgriProcessors, the nation’s largest producer of kosher meats. The unusual story goes back to 1987, when Aaron Rubashkin and other members of a Lubavitch Hasidic sect moved from Brooklyn to (mostly Lutheran) Postville. That would have been a culture shock (on both sides) worth observing. In the years since, AgriProcessors has established itself as the town’s main employer. The company has also become notable for dubious workplace practices: routine violations of fair employment laws, hiring underaged workers, falsifying documents on workers, wastewater pollution problems and inhumane slaughtering of animals. Eduardo, if you will forgive the pun, has put his finger on the crux of the matter. These are jobs few are willing to take. The working conditions are abominable. The company owners may invoke a “higher law” in attempting to follow kosher rules, but they are demonstrably deficient in their application of the more mundane laws which govern the way we work. There is a sense in all of this that the workers may not be the primary target of the raid. (See an excellent summary by Debra Nussbaum Cohen in the Jewish Weekly.) To be sure, the workers face very difficult times, leading inevitably to deportation for most. The feds, however, have positioned themselves to go after AgriProcessors’s owners. Rabbi Sholom Rubashkin, the plant operator, finds himself accountable to rather formidable authorities of the conventional sort. There are no clear winners here. The workers have been freed from jobs which they willingly embraced; they are about to be thrown out of their adopted community. Jewish consumers have lost their primary source of kosher meats. The town of Postville has lost its primary employer and will soon see the evisceration of its tax base. The Postville saga is indicative of the overall undocumented worker dilemma: workers of last resort tolerate intolerable conditions because they are not supposed to be here in the first place. They take jobs no one else will take. Their pay and conditions fail to meet our basic standards, but are still far superior to what is generally available in Guatamala and Mexico, where most of these particular workers came from. The ICE raids put a temporary halt to unacceptable working conditions in one small town. A handful of undocumented workers will be sent home. Some managers might end up in jail. It’s not even a drop in the proverbial bucket. It’s a drop in the ocean. Nonetheless, if members of Congress pay attention to the single drop hitting the water, they might remember it. They might actually try to do something about it. Post Traumatic Stress Disorder: Not in This Army! Norma Perez is a psychologist who leads the post-traumatic stress disorder (PTSD) program at a medical facility for veterans in Temple, Texas. As we read in the Washington Post, she is pretty busy with claims. Given that veterans with a PTSD diagnosis are eligible for up to $2,527 a month in disability benefits, she came up with a great way to reduce caseloads and save money: stop making the diagnosis. In an email to mental health specialists and social workers at the facility, she recommended that they consider using a diagnosis of “Adjustment Disorder” (which does not involve a disability payment). She added that they “really don’t have time to do the extensive testing that should be done to determine PTSD.” An interesting concept, given that Perez was in charge of a PTSD unit. The VA has tossed Perez under the bus. Veteran Affairs Secretary James Peake issued a statement calling Perez’s email “inappropriate” and incompatible with VA policy. The Perez doctrine “has been repudiated at the highest level of our health care organization.” Peake went on to state that Perez has been “counseled” and is “extremely apologetic.” She remains in her job. Let’s face it. Perez has been under a lot of stress lately. She could probably find a shrink to put her out of work for a few weeks, but she should not count on workers comp to pick up the tab. Stress claims are rarely compensable. Norma’s stress is both work-related and self-induced. When it comes to benefit entitlements, she is on her own.